I COULDN’T STOP THIS STUFF!!!!!!!! This is a simple, savory/sweet, and very addictive little dish!!!! The final bit didn’t taste quite like pumpkin spice, so I’m thinking adding more spice wouldn’t hurt – definitely go for heavier on the spice maybe even throw in some cinnamon! I got this recipe from Averie Cooks, used it for a party and HAD to share. Check her out – some great stuff on there!!! 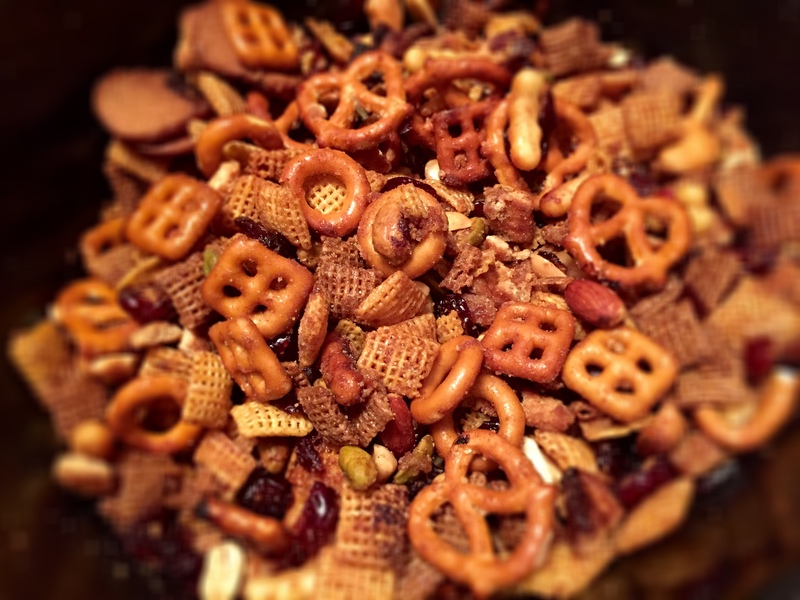 In a 5 to 6-quart Crock-Pot, add cereal, dried fruit, nuts, pretzels, and graham crackers. Recipe is very flexible. If you don’t have something, don’t like something, etc. use something you do have on hand or omit. Slowly and evenly drizzle wet mixture over the dry ingredients in Crock-Pot and stir very well to combine. I use a silicon-tipped spatula so I don’t break the cereal. Cook on high power for about 2 hours, stirring well every 15 to 20 minutes. Start keeping a more careful eye on mix at about 1 1/2 hours to make sure pieces on bottom don’t start burning. All slow-cookers and ingredients vary, and cooking times will vary. Cook until there’s no visible liquid pooling and pieces have dried out. They will not be ‘dry’ and will be more on the sticky and tacky side even when done, but do dry out more as they cool. Note – Although I haven’t tested it, you could probably bake in a 250F oven, with the mixture divided between two baking trays. Keep a very watchful eye on it and toss every 15 minutes until it’s done.